We have received so many requests for this piece that we had to get it, even if we knew that preparing it would take much longer than usual. 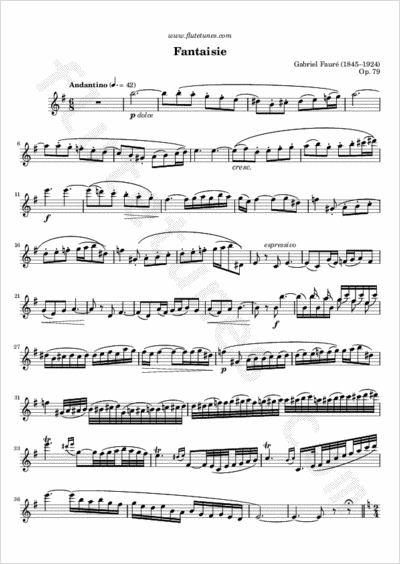 This famous work is dedicated to Paul Taffanel, often called the father of the modern French school of the flute. He was a busy man, active at the Opéra de Paris, in the Conservatoire concerts, as the leader of the Orchestre de la Société des Instruments à Vent, and, from 1893, as a professor at the Conservatoire. Fauré was appointed professor of composition there in 1896, and it was almost inevitable that Taffanel should ask him, in the spring of 1898, to write a sight-reading piece (the Morceau de lecture) and a concours composition for the July examinations. Fauré decided to pass the orchestration of his incidental music for Maeterlinck's play Pelléas et Mélisande, on which he had been feverishly working, to his pupil Charles Koechlin, so he could get to grips with the concours piece. The “Fantaisie” for flute and piano occupied him from the beginning of June until at least mid-July. The first performance of the Fantaisie was given by the concours winner, Gaston Blanquart, on July 28, 1898.